These are posts containing brief quotes or extended quotations for consideration and comment. Have you ever had the sensation of reading something profound? 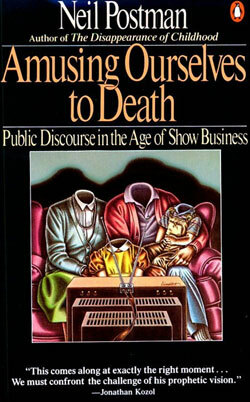 Have you ever been impressed that san author could write something so timely -- but had written it decades ago? We were keeping our eye on 1984. When the year came and the prophecy didn’t, thoughtful Americans sang softly in praise of themselves. The roots of liberal democracy had held. Wherever else the terror had happened, we, at least, had not been visited by Orwellian nightmares. But we had forgotten that alongside Orwell’s dark vision, there was another-slightly older, slightly less well known, equally chilling: Aldous Huxley’s Brave New World. Contrary to common belief even among the educated, Huxley and Orwell did not prophesy the same thing. Orwell warns that we will be overcome by an externally imposed oppression. But in Huxley’s vision, no Big Brother is required to deprive people of their autonomy, maturity, and history. As he saw it, people will come to love their oppression, to adore the technologies that undo their capacities to think. In 1953, a Canadian educator by the name of Hilda Neatby, hit a nerve with her book, So Little for the Mind. She drew the title from a Cardinal Newman quote, "Any self-education in any shape, in the most restricted sense, is preferable to a system of teaching which, professing so much, really does so little for the mind." Neatby caused a stir because of her disrespectful use of the expression "expert in education," considering it to be an insult to a noble calling. "It degrades the most difficult art of nourishing and disciplining and inspiring the mind to the level of a special technique. It de-humanizes education. I could pay no higher compliment to an educational leader than to say that, although he may have expert knowledge in certain fields, that is the leat of his qualifications for the extremely important work that is given him to do." "Democratic equalitarianism encouraged the idea of a uniform low standard easily obtainable by almost all. Special attention was given to all physical, emotional, and mental abnormalities, but the old-fashioned things called the mind, the imagination, and the conscience of the average and of the better-than-average child, not not exactly forgotten, slipped into the background. As a result, the much-maligned tranditionalist is now retorting with some pretty rigorous criticisms of progressive education as he sees it. "It is frankly anti-intellectual. There is no attempt to exercise, train, and discipline th mind. This is old-fashioned language, now forbidden by the experts, but its meaning is still clear to the literate person. The traditionalist firmly and even brutally conveyed a body of facts which must be learned precisely, and which provided, as it were, the material of thought. Or he might demonstrate the process of thought through the admittedly painful process of causing the pupil to memorize a mathematical proposition and its proof. True, the matter often began and ended with memorizing, and never reached the stage of thinking. The progressivist noted this, but instead of taking over and doing the thing properly, he threw up the sponge. Because, he argued, inteelectual training is difficult and painful and many fall by the wayside, throw it out alltogether. Failures spoil the record. The denial by the schools of the duty of intellectual training is neatly reflected by the current fashion of lightly dismissing in argument an unanswerable fashion of lightly dismmissing in argument an unanswerable proposition as "a question of semantics." "Progressivism is anti-cultural. This is quite in keeping with the revolutionary, pseudo-scientific materialist fashions of the day. In this scientific age, we find that everything, not just educational methods, but everything, is better than it used to be. It is the pride of the machine age that we can now understand, manipulate, and control men as we do machines. Why should we look at the evidence of human joys, sorrows, failures, and achievenments of the past? It would almost be an admission of defeat. We manage everything better now. . . .
"Progressive education is, or has been, amoral. There is something of a reaction today, but for a generation it has been unfashionable, to say the least, to speak openly of right and wrong actions. Teachers take cover instead under "desireable" and "undesirable" "attitudes" or "responses." But these are not enough. The pupil soon learns that in a democratice society he has as much right as anyone else. Even the elementary discipline of establishing rules which the child was required to keep was questioned. True, rules certainly existed in practice; but pragmatic theory frowned on all external control and therefore rules were enforced uneasily and with a bad conscience. The general tendency of the progressive approach has been to weaken respect for law and authority as such, and to dull discrimination between right and wrong, by the teaching, implied if not expressed, that "desireable" actions on the part of the child (actions pelasing to others) will bring "desireable" responses (actions pleasing to him)." This excerpt comes from “It’s Not About the Dream,” WORLD magazine, Sep 24, 2011, 57-58. VeggieTales was a rags-to-riches entrepreneurial success story. Vischer and his counterpart, Mike Nawrocki, left college to pursue their dream of making wildly creative children’s videos. At the height of their success in the late 1990s, VeggieTales videos sold 7 million copies in a single year and generated $40 million in revenue. 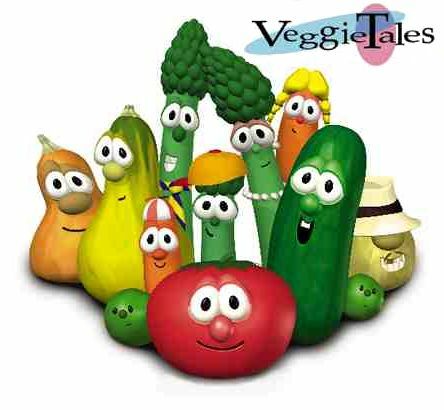 Though primarily aimed at a Christian market, VeggieTales had a broader cultural influence, pushing forward the boundaries of computer animation and children’s programming. But success brought failure. Though Bob the Tomato and Larry the Cucumber are still around, they aren’t the same. Big Idea Productions went bankrupt in 2003 and Vischer lost ownership and creative control of the whole enterprise. VeggieTales is no longer VeggieTales. The characters still exist – and in some cases are even voiced by Nawrocki and Vischer as hired talent – but the decisions are now made by studio execs who don’t share the vision or worldview of the original founders. “I looked back at the previous 10 years and realized I had spent 10 years trying to convince kids to behave Christianly without actually teaching them Christianity. And that was a pretty serious conviction. You can say, ‘Hey kids, be more forgiving because the Bible says so,’ or, ‘Hey kids, be more kind because the Bible says so!’ But that isn’t Christianity, it’s morality. American Christian[s]… are drinking a cocktail that’s a mix of the Protestant work ethic, the American dream, and the gospel. And we’ve intertwined them so completely that we can’t tell them apart anymore. Our gospel has become a gospel of following your dreams and being good so God will make all your dreams come true. It’s the Oprah god… We’ve completely taken this Disney notion of ‘when you wish upon a star, your dreams come true’ and melded that with faith and come up with something completely different. There’s something wrong in a culture that preaches nothing is more sacred than your dream. I mean, we walk away from marriages to follow our dreams. We abandon children to follow our dreams. We hurt people in the name of our dreams, which as a Christian is just preposterous." For Whitehead, “From the very beginning, children should experience the joy of discovery.” Firstly, students ‘romance’ the new material. That simply means play around with it through creative processes either on their own or with their peers. The material then transforms from being new information into something much more familiar to the student on a personal basis. Secondly, students gain the ‘precision’ required to perpetrate the new material (this is the technical aspect of the process, something that Band Directors do very well). Thirdly, students now place the material into a context that brings meaning to them, allowing a connectedness to develop between the material, the outside world and the individual. For many Directors, their programs start and end with the ‘Precision’ component of the educational journey. Little consideration is given to contextualization, and how many times have you heard a fellow colleague say ‘I would do more composition/creative activities, I just don’t have time’ ? Romance is not just about creativity, it’s focus is self discovery, a vital educational ingredient for the 21st century child. It’s possible to add a little romance into every rehearsal without too much effort at all. In fact, teaching strategies that engage the students creatively allow you a moment to step down from the podium, and regain your thoughts. Teaching with this approach provides much needed opportunities to rest your own brain a little - thus helping you to regain focus on the reason you are there - the music. Did you notice the upending of the order of grammar, logic, and rhetoric and the heavy emphasis on the student's experience? This is the kind of thinking that permeates modern music education. Blackshaw would have us put play and creativity first. A student may want to play with a musical idea, and that might even be considered a noble task, but until a foundation of grammar and logic is laid, any "creative expression" (rhetoric) will be haphazard and misguided at best. It is far better to have, in the end, a rhetorical specimen that is good, true, and beautiful than one whose sole virtue is that it is "mine."
. . . if I'd'a' knowed what a trouble it was to make a book, I wouldn't'a' tackled it, and ain't a-going to no more. But I reckon I got to light out for the Territory ahead of the rest, because Aunt Sally she's going to adopt me and sivilize me, and I can't stand it. I been there before. Huck is confident that he will maintain his happiness and virtue better out in the Territoy, close to nature,than he will in town, near civilization and Aunt Sally. But there is little in human history to justify this Romantic faith. The conflict between our Enlightenment and our Romantic views of human nature continues unabated in American culture today. Lately, there has perhaps occurred a tempering of our optimism about the beneficence of things natural and the innate goodness of human nature -- the tragedy of the Vietnam War, the halt in continually rising prosperity, the omnipresent television scenes of genocidal conflict throughout the world, the violence among children in our schools -- this drumbeat of tragic experience has tended to qualify our anti-tragic Romantic faith in the inherent goodness and dependability of the human child when allowed to follow its own development. Increasingly, there has been a questioning of the belief that all will be well if the child is encouraged to grow naturally like a tree, and there has been a renewed interest in the idea of moral education -- a kind of symbolic reinstatement of Aunt Sally. -- From The Schools We Need by E.D. Hirsch, pp. 77-78. "How would I teach music if I didn't have to compromise?" This question is pie-in-the-sky wishful thinking for some people, but it's not an unimportant question. David Vandewalker, assistant band director at Georgia State University, as part of a presentation to the Smith Walbridge Directors Clinics, lamented that when he started teaching music, he didn't know the definition of a "music educator:" a "Special events administrative manager for a community-oriented small business with a serious music problem." This is a hard pill to swallow for students in music education preparatory programs who think they are going to spend more of their professional lives "doing music." I would estimate that in most cases, only 10-30% of the "job" involves music. Does it have to be this way? How would you teach music classically if you did not have to compromise? Please comment below. "The crowning virtue of the modern school, the secret of all its success is that the children do what they want to do, or they want to do what they are doing. 'They have such a good time.' In music, they learn no theory: it is such hard work. They play on a tonette by numbers. "But should it be a 'major aim' of the school either to amuse the children or to make them feel that they are 'really good'? Would it not be better to avoid complacency as well as frustration by providiing healthy and vigorous occupations for the mind?" (pp 203-204).